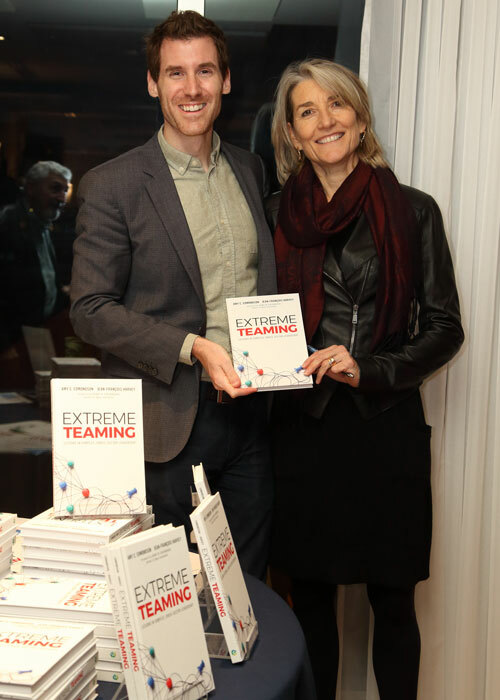 Extreme Teaming, by Amy Edmondson and Jean-François Harvey, was launched on October 30 at HEC Montréal, part of a conference on the theme of Teaming Inside and Out, bringing together a number of leading management scholars for the occasion. In their book, the Professor of Leadership at the Harvard Business School and the Assistant Professor in the HEC Montréal Department of Entrepreneurship and Innovation present the findings of a multiple-case study, each involving challenges of interdisciplinary and interorganizational collaboration, and identify leadership practices that support teaming in such situations. As Professor Henry Chesbrough emphasizes in the book’s foreword, today’s realities are increasingly bringing organizations to collaborate across boundaries. Harvey explains that as a result teams are often unstable, poorly bounded and may have to cope with significant interpersonal or technical challenges. As an example, Harvey cites the Haiti Hope project. In this extreme teaming case, individuals from different disciplines and organizations worked together to double the revenue of 25,000 Haitian mango farmers. The ambitious initiative called for leadership practices adapted to its great complexity and high level of uncertainty. In their book, Harvey and his co-author analyze five similar cases in depth and draw conclusions about these good practices. Amy Edmondson is well known for her work on organizational learning and teams, particularly on the concept of psychological safety. She has been published in leading scientific journals and her impact on practice has been recognized internationally. Professor Edmondson was Harvey’s supervisor during his post-doctoral studies at the Harvard Business School. This led to their decision to write their book, in order to analyze in greater detail a number of cases they had observed over the years. Jean-François Harvey joined the Department of Entrepreneurship and Innovation at HEC Montréal after completing two years of post-doctoral studies at the Harvard Business School. He is interested in how individuals, teams, and organizations learn, with a particular emphasis on how they can overcome the inherent difficulties of working across disciplinary and organizational boundaries. He has examined these issues with public- and private-sector organizations in Montréal, Tokyo, London and San Francisco. Extreme Teaming: Lessons in Complex, Cross-Sector Leadership, by Amy C. Edmondson and Jean-François Harvey, Emerald Publishing Limited 2017, 224 pages. Available at the COOP HEC Montréal.